Glencadam is a little known distillery that is located in the eastern Highlands town of Brechin, which lies between Dundee and Aberdeen. It was founded in 1825 and is the last remaining distillery in a once rich whisky producing area. It has a renowned history of producing and supplying whisky to some of Scotland's biggest blending houses, with Glencadam historically forming an important part of top selling blends such as Ballantine's and Teacher's. Today their whisky is the cornerstone of the Angus Dundee blended range of whisky. Angus Dundee Distillers took over the distillery and reopened it in 2003. It had been closed by the previous owners in 2000, but everything was kept intact so that production could restart immediately (this is called 'mothballing'). They soon had Glencadam running back at full capacity, which is 1.4 million litres per year, and built a blending centre on the site in 2006. This 10 years old forms part of a revamped range of single malt whiskies that were released by Angus Dundee in mid 2010. It joins a 15 and a 21 years old in the core range and these are to be supplemented by additional limited releases, of which the current two are the 12 years old Portwood (finished in Port casks, unsurprisingly!) and the 14 years old Sherry Finish. All of the new range are to be bottled at a 46% ABV, which is a higher strength than previous bottlings from Glencadam, and are not chill filtered. For an explanation of chill filtration - click here for our 'Explain About ...' post. This 10 years old is available in specialist whisky and liquor retailers and should cost £30-35 a bottle. The colour of this Glencadam 10 years old is a light yellow gold and the nose is light and fresh, yet intense. There are a number of very pleasant and fragrant aromas that are present - predominantly vanilla, honey and cereal grains. With time, further notes of dried grass (think of hay), crisp green fruit (especially pear and apple) and oak (imagine pencil shavings or sawdust) start to come through and develop. After approximately five minutes in the glass a distinct note of custard powder is evident. The palate, like the nose, is simple but very well constructed and full of strong characteristics. The whisky is fresh, vibrant and makes your mouth water with an initial note of striking lemon zest. Then some sweeter flavours appear, such as the pleasant honey, vanilla and green fruits from the nose. Again, further notes develop with time - some shortbread, malty cereal grains and zingy, tangy sherbet. The finish is also tangy with plenty of initial vanilla and honey giving a good sweetness. However, it then becomes much drier and woodier with oak and ginger spice coming through. 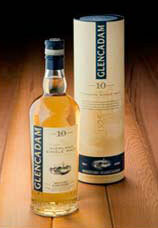 This Glencadam 10 years old is a lovely whisky that exhibits characteristics classic ex-bourbon cask maturation. It's lightness, freshness and vibrancy would make it ideal as an aperitif dram or in hot weather. Glencadam has always been said to be an under rated distillery, but the classical nature of the whisky should gain it plenty of new fans and we can't wait to now try the other whiskies from the new range. A delightful dram. Fancy making some single malt whisky next year? Now you can, as Glenrothes are offering the chance to spend a week at the Speyside distillery in Scotland and to learn about all aspects of whisky production. 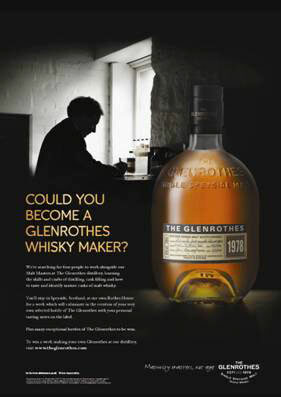 Four lucky winners of the Glenrothes Whisky Makers competition will be selected to take part in the week long 'once in a lifetime' experience next Spring - all you have to do to enter is visit www.theglenrothes.com/whiskymaker and write why you deserve to be selected. The competition was launched back in October and the closing date is January 31 2011. Glenrothes is one of the largest Scotch whisky distilleries in the Speyside region of Scotland. It is located within the town of Rothes and has a capacity of approximately 5.5 million litres per year. The distillery was founded in 1878 by Stuart & Co. and since the early 1990s has been owned by Berry Brothers & Rudd, the famous London wine and spirits merchants. They signed up to distribute Glenrothes as a single malt whisky, in return for the use of the whisky in their popular Cutty Sark blended whisky range. They introduced the current vintage system for Glenrothes single malt whisky and in 1999 were joined by the Edrington Group in partnership. The range and popularity of the Glenrothes single malts continues to grow under this ownership and the distillery still provides the signature whisky for the Cutty Sark range. The prize for the Glenrothes Whisky Makers competition offers a fantastic opportunity for the four lucky winners. Each winner will stay for the week at Rothes House, a former parish residence belonging to the church, where they will be hosted by the legendary Ronnie Cox, the Global Brand Director of Glenrothes, and Gordon Motion, the Glenrothes Malt Master. The whisky making experience will cover everything from testing the local water quality, through to the milling, mashing, fermentation and distillation processes, before finally trying their arm at cask making in the on site cooperage and studying maturing casks and selecting some for bottling. In addition, other activities will be undertaken such as fishing, dining and walking in the beautiful local area. This competition offers a real 'dream come true' experience and entering is simple, so why not have a go before the end of January? We wish you good luck. Inbox is a weekly round up of whisky news and PR type material that has found its way in to our email inbox. Sadly, we cannot write full articles or do justice to every piece that we receive, so Inbox has been born! It will feature items from around the world of whisky and will be published by us each Friday. Within Inbox we will write a couple of lines about each press release/piece of news/PR event that we have received and provide links, where possible, for you to find out further information if you want to. However, with most PR and marketing departments winding down for the Christmas and New Year festive season, news and information have been in short supply this week. As a result, we have decided put Inbox in to hibernation for a couple of weeks until things pick up again. We are planning the next Inbox for Friday January 14 2010 (news permitting!). We would also like to take this opportunity to publicly congratulate two friends and supporters of Whisky for Everyone since our early days - Keith Wood and Oliver Klimek - who this week became members of the elite group of Malt Maniacs. The Maniacs are a small group comprising members, who are all whisky fans and/or journalists, from all around the globe and their website is a 'must read' for all whisky drinkers - visit www.maltmaniacs.org for more details. We eagerly await the first contributions of Keith (who runs the incredibly detailed Whisky Emporium website) and Oliver (who writes the excellent dramming.com whisky website) to the Malt Maniacs. Check out both of their great sites if you haven't already. Bowmore distillery is located on the western Scottish island of Islay, which is famous for producing the smoky, peaty style of whisky. It was founded in 1779 by John Simpson - this makes it the oldest of the eight distilleries currently operating on the island and one of the oldest in Scotland (only Glenturret in the Highlands is older, having started production in 1775). It is located on the shores of the large inland sea loch of Loch Indaal and the name of Bowmore translates as 'sea rock' from Gaelic. The distillery in currently owned by Morrison Bowmore, a subsidiary of the Japanese company Suntory, who also own the other Scottish distilleries at Auchentoshan and Glen Garioch. 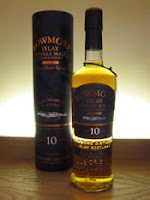 Bowmore has an annual production capacity of two million litres and is one of the biggest selling single malt whisky brands in the smoky, peaty style. The Tempest is a small batch bottling and it is planned that a new batch is released approximately twice a year – Batch 1 (of which our sample is from) was released in early 2010, with Batch 2 coming in mid 2010 and the next batch penciled in for release in early 2011. Batch 1 was matured exclusively is specially selected first fill ex-bourbon casks and a small amount of these were mixed together to create the final whisky. It is bottled at 10 years of age and has an alcoholic strength of 55.3% ABV. Both Batch 1 and 2 retailed in specialist whisky stores for around the £40-45 mark. We thank Cara Laing of Morrison Bowmore for our sample of Tempest and for her time spent talking about the bottling with us. 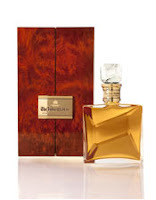 The colour of the Tempest is vibrant gold and the nose is a wonderful combination of sweet and smoky aromas. The sweetness has elements of caramel, butterscotch, marshmallow, malty cereals and dark dried fruit (think of raisins especially) to it, while the smokiness is a mix of a bonfire and damp, earthy moss. There are also hints of vanilla, dried orange peel and a woody spiciness that becomes more vibrant with time in the glass. On the palate, this feels instantly creamy and rich with a prominent sweet butterscotch note hitting first. Then come more savoury notes of the mossy smoke, wood spice and a hint of salt. Further sweetness is introduced as other characteristics develop – some vanilla, honey, toffee – but these are balanced by the smokiness, spiciness and tangy citrus (more like orange zest this time). The finish is very long and particularly smoky, with a distinctly bitter hit of iodine adding further complexity to the many other notes present from the palate. Bushmills holds the oldest distillery license in the world and this dates back to 1608. The distillery is named after the town of Bushmills in which it is located and lies close to the northern County Antrim coast in Northern Ireland, just two miles from the famous Giant’s Causeway. Global drinks company Diageo are the current owners and sales of the Bushmills whiskey range had plummeted before they took over in 2005. Now sales are growing rapidly following a sustained promotional campaign. The distillery is once again running at full capacity (approximately three million litres per year) to meet current demand. In addition to being the oldest licensed distillery in Ireland and the world, Bushmills also has the longest continually used logo. In 1784, the pot still logo was introduced in order to celebrate the formal registering of the distillery and this is still in use today, 226 years later! Bushmills’ whiskies are all triple distilled in the traditional Irish way and the core range is a mixture of single malts and blends - the 10 years old and 16 years old are single malts, with the Original and Black Bush being blends. These are occasionally joined by special limited releases, such as this 21 years old. The 21 years old is an annual bottling, which was first released in 2001, and this year's release is limited to just 6,000 bottles. About a third will be allocated to the USA market, with the remainder shared between France, Ireland, the UK and the rest of Europe. This 2010 release has spent its first 19 years maturing in a combination of ex-bourbon and ex-sherry casks, before being transferred for the last two years in to ex-Madeira casks. It is positioned at the top of the Bushmills range, both in price (recommended price is £120) and age. We were delighted to be invited to the UK launch, held at the Waxy O'Connor's pub in central London, where the Bushmills Master Blender Helen Mulholland opened bottle number 0001 of the 6000 for the assembled crowd to taste. This 21 years old 2010 release is bottled at 40% ABV and the colour is golden amber. The nose is fresh and fruity, with plenty of dried fruits immediately present (think of raisins, sultanas and apricot). These are backed up by distinct malty cereal notes, some toffee and caramel aromas, and then something nutty (imagine toasted almonds) and some baking spices (especially cinnamon and nutmeg). On the palate, this whiskey feels incredibly soft and pleasantly coats the inside of your mouth. There are notes of distinct, almost sugary, sweetness (think of toffee and caramel again) and plenty of malted cereals, reminiscent of a robust biscuit like an oatcake. Then come some of the other characteristics from the nose - the dried fruits (especially raisins), toasted almonds and baking/woody spices. The overall combination of notes reminded us of Christmas pudding or rich fruit cake. A hint of dark chocolate develops right at the end. The finish is again initially sweet with that chocolate note coming through more prominently, before becoming incredibly spicy and drier - think of those woody baking spices again (cinnamon and nutmeg) plus a hint of clove. This Bushmills offers a lovely dram of whiskey that gives a good mix of sweetness and spices. The aromas on the nose and flavours that come through on the palate are particularly good, with an interesting and excellent complexity. The finish is not quite to the same standard but still enjoyable, although it may be too spicy for some. Overall, this version of the 21 years old is a deliciously rich and pleasant whiskey that is well worth trying, if you get the chance. 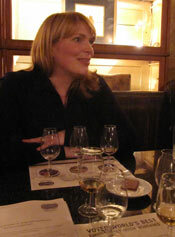 At the same event, we had the opportunity to speak with Helen Mulholland - the Master Blender at Bushmills. We thank Helen for the time that she spent with us, on what was a busy evening for her. To read about what she had to say about Bushmills distillery and its whiskey - click here. A new whisky and cheese menu has been created at a central London hotel. It has been created by former Blur guitarist and now cheese maker Alex James (pictured, in centre) and two staff at the Anthenaeum hotel in Piccadilly, London – David Marshall, the hotel’s Head Chef (pictured, on left) and Angelo Gobbi (pictured, on right), the hotel’s Whisky Sommelier (yes, they have a whisky sommelier!). The Athenaeum ‘s whisky bar contains a range of over 270 whiskies and the menu can be sampled either there or in the comfort of your room. The menu includes such combinations as Chivas Regal 12 years old served with Westcombe Cheddar and Gentleman Jack from Jack Daniel’s with Suffolk Gold. Alex James comments, “the range of flavours spanned by first class cheese and whisky is so vast that matching them can be quite a tricky business. Sometimes it's the most unlikely combinations that produce the most spectacular results”. In addition, James has created a whisky infused cheese, named Athenaeum, which will be exclusively sold at the hotel. The results for the annual Malt Maniac Awards have been published earlier this week and the whisky industry has been taking in the results. The Malt Maniacs are a group of whisky connoisseurs that are spread around the world and 11 of the ‘Maniacs’ took part in this year’s judging process, which included a whopping 262 whiskies entered! The highest scoring whisky was the Gold Medal winning Glendronach 1972, which is matured in an ex-Oloroso sherry cask (cask number 700, to be exact!). Regional Sales Director Alistair Walker was delighted: “To be awarded first place ahead of another 261 fine whiskies is a wonderful achievement". Glendronach also celebrated a Silver Medal for their Grandeur 31 years old bottling and a Bronze for the 18 years old Allardice from their core range. 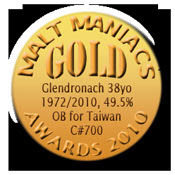 The full list of medal winners can be found on the Malt Maniacs website - click here for the results page. The owners of the famous Irish whiskey brand has announced that it has just broken through the three million bottles barrier for annual sales for the first time ever. These figures are for the year between November 2009 and October 2010 and consolidate Jameson’s standing as the world’s best selling Irish whiskey, by far. Jameson is made at the Midleton distillery in County Cork and the brand is owned by multi-national drinks giant Pernod Ricard. The published figures represent a total 9% growth in world sales with certain markets showing particularly decent increases – the USA was +24%, Russia +8% and both France and South Africa were +7%. 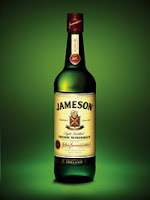 Alex Ricard, the Irish CEO of Pernod Ricard, comments “we are delighted with the progress of Jameson globally. Almost 230 years since the Jameson Distillery was founded, this is a huge achievement for the brand. It is the passion of the people behind the Jameson brand that is one of the greatest reasons for our success”. Recently we had the pleasure of meeting Helen Mulholland, Master Blender for Bushmills Irish Whiskey, at the London launch of their new premium packaging for their 10, 16 and 21 year old whiskies. 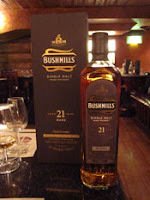 Bushmills is named after, and located in, the quiet town of Bushmills on the County Antrim coast of Northern Ireland. The distillery is located remarkably close to the famous Giant’s Causeway which is one of Ireland’s most well-known tourist attractions. Bushmills holds the oldest distillery license in Ireland (since 1608). A remarkable fact that the new packaging was created to celebrate, along with the distillery’s trademark pot still. As we rarely get the opportunity to chat with a renowned Master Blender, and certainly not in the cosy depths of a central London bar with a glass of her whiskey in hand, we decided to grab a few minutes of her time to ask a question or two. In a similar way to all good Master Blenders, Helen worked her way into the position through years of hard work and dedication. She began working with Bushmills in the lab on a student placement that lasted 6 months. After this relatively short time, she headed off to complete her Master’s degree after which time she returned back to Bushmills. After Diageo acquired Bushmills in 2005 the role of blender was created, and with a number of years having learnt the trade of whiskey making inside and out, Helen was chosen as the woman for the job. Without a second thought Helen replied “Bushmills is a place that is alive and breathing.” She clarified this by saying that every part of the whiskey making process happens on site, including bottling. They are also in the rare position of having their own Cooper on site. She feels that the team that works so hard to make the whiskey is one large family and that the malts produced feel like their children. As each malt is made and matured using natural ingredients and elements, this allows the magic of personality to form. Unrepeatable combinations of grain, water, yeast, wood for the cask, and the local climate in the warehouse, allows each cask of whiskey to develop its own unique character. While you may expect a Master Blender would say something similar to this, Helen’s eyes light up when she talks about the team that work with her and the whiskies they produce so you quickly realise this is a woman who is proud and passionate about her job and the distilleries heritage. Helen believes that Bushmills makes whiskies for people to enjoy – a range of whiskey that is very approachable and offers something for everyone. A sentiment that we heartily embrace. Bushmills produce a range of whiskies that apologetically aim a diverse audience while maintaining the characteristic fruity smoothness that comes with triple distillation. Their various whiskies respond well with the infinite ways that people chose to enjoy their whiskey - straight, with water, with ice, with a mixer, and more. Helen chose to prove this point in a rather unexpected manner by handing us each a glass of frozen (yes frozen!) Bushmills 10 year old single malt. This was not what either of us has anticipated. What an experience though. Freezing cold, the whiskey took on a completely different personality. It became noticeably more viscous and mouth-coating, sweet but not cloying, and took on an enhanced note of honey, something akin to a really impressive liqueur. In short, we both found it absolutely delicious and refreshing. "Does Helen have any cool facts about Bushmills?" Both are us are big geeks when it comes to bits of trivia that are not widely known, so we had the perfect opportunity to find a few pub quiz style facts about Bushmills. Helen was happy to provide. Bushmills is one of the most visited distilleries in the UK with over 100,000 visitors per year. We guessed this most likely has something to do with the distillery's close proximity to the famous Giants Causeway that 'links' Ireland to Scotland in folklore. We didn't realise just how close. The distillery, in fact, shares a boundary with the World Heritage (UNESCO) Site within which the Giant' Causeway is located. Not bad facts at all. We really must thank Helen for the time she spent with us and her genuine passion for Bushmills distillery and its whiskies. We had a thoroughly inspiring and enjoyable evening. If you are planning a trip to visit Bushmills and witness Helen's hardwork in action, arrange a tour with the distillery (www.bushmills.com/Visit) but do make sure you visit the Giant's Causeway (whc.unesco.org) while you are there. Connemara is a Irish whiskey produced at the Cooley distillery. It is located on the County Louth coast, roughly half way between Belfast and Dublin and is one of only three whiskey distilleries that are currently operating in Ireland - Bushmills and Midleton being the other two. Cooley was founded in 1987 by John Teeling and his idea was to resurrect some of Ireland's oldest whiskey recipes and traditions that had become extinct during more difficult times. He converted an old vodka distillery and Cooley has since won over 100 awards worldwide, including the title of European Distillery of the Year at the recent prestigious International Wine & Spirits Competition awards. At Cooley they produce whiskey using traditional recipes, each with a different mixtures of barley and other grains. Their range includes some famous Irish whiskey names such as Greenore, Kilbeggan, Locke's, Michael Collins, Millar's and Tyrconnell. Around 95% of all the whiskey produced at Cooley is exported, with the UK, mainland Europe and South Africa being the current main markets. Connemara is the only peated Irish whiskey that is in regular production. Other Irish smoky whiskies are occasionally released but are rare. 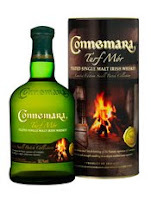 Connemara, which is names after the original site of the Connemara distillery on the west coast of Ireland near Galway, and its old traditional recipe had disappeared into history before being resurrected by John Teeling. The first expression of the modern Connemara was launched in 1996 and this Turf Mór forms the second part of Connemara's Small Batch Collection, a series of limited edition whiskies that will released at regular intervals - the first release was the Sherry Finish from last year. The Turf Mór is the peatiest Connemara released to date with a high peat level of over 50PPM (PPM is the scale of measurement for peat/phenol levels in whisky and means Phenol Parts per Million). For further information on this and the influence of peat in whisky - visit our website. Regular Connemara is around 20-25PPM and this new expression puts it close to the peat levels of famous smoky whiskies, such as Ardbeg and Laphroaig. The Turf Mór is bottled at its natural cask strength of 58.2% ABV and retails for £40-45 from specialist retailers. This is a delicious and very positive dram. So often, young peaty whiskies can give you a less pleasant and negative experience. Turf Mór is a whiskey that makes it very obvious as to how Cooley distillery are so successful and continue to win major awards. The excellent balance, combination and contrast of aromas and flavours - the acrid burnt peat, the sweet vanilla and honey, the tangy lemon and salt - make this a dram to savour. If you like the peaty, smoky style of whiskies, then you simply have to try this one - it's a cracker! The John Walker is a new premium whisky that has been created by Diageo, the owners of the Johnnie Walker brand, in order to celebrate the life of the brand's founder John Walker. This new whisky sits at the very top of the Johnnie Walker range, above the famous Blue Label and the King George V bottlings, and is aimed at the buyer of high end Cognac. It has been blended from just nine specially selected casks and these casks are a mixture of single malt and grain whiskies, with some being of a high age and others coming from distilleries that are now closed. The identities of the distilleries are not revealed but the result of the blending has meant that only 330 bottles are available. As a further result of the rarity of the bottling and of some of the whiskies included, the price tag is high at £2,000 a bottle. The strength of The John Walker is 43% ABV and the colour is golden amber. The nose is initially understated but it becomes more expressive with time in the glass. There is a distinct aroma of robust malty cereal grains to begin with and this is backed up by plenty of more subtle aromas, which give a pleasant depth and complexity - surprisingly tangy orange zest, vanilla, honey, dried fruits (think of sultanas and raisins), oatcakes, caramel, waxy furniture polish and a whiff of slightly sulphuric smokiness. On the palate, this John Walker has a lovely silky smooth richness and surprisingly bolder than the nose suggested. Again, the malty cereal notes are the first flavours to appear. Then comes additional sweeteness driven by notes of vanilla, honey and dried fruit. The sweetness is tempered by drier and spicier characteristics, including further cereals, that tangy orange zest from the nose, plenty of wood spice (imagine sandalwood and cinnamon) and an increasing hint of bonfire-like smokiness. The finish is pleasant with initial sweetness, before turning dry with plenty of those wood spices and bittersweet grains. However, it is disappointingly short - just as you are enjoying and assessing the complexity, it disappears without trace. The John Walker is a lovely and clearly well made whisky, that has decent depth and complexity of aroma and flavour. In fact, the nose and palate are very pleasant and drinkable, before that disappointingly short finish. Would we pay £2000 for a bottle? - no, probably not. If we had that money then it would buy us a lot of equally good, if not better, bottles of whisky. However, that is not the point of The John Walker - it is a premium purchase, a status symbol, an aspirational purchase, a collector's item (delete as appropriate). When considering this, it definitely fits the bill - it looks the part, it tastes the part and is a very good whisky. Try it if you can! The Jura distillery, owned by Whyte & Mackay, have announced the launch of Wish You Were Here - an online photographic competition in which they ask for your images of the world's most inspiring places. They have teamed up with VisitScotland as part of a new initiative to get people to visit Scotland and sample some of its speciality foods and drink. The prize is for three lucky winners (one from the UK, one from Europe and one from the USA) and includes a week long stay on the isle of Jura with all travel arrangement paid, a VIP tour of the Jura distillery, an Olympus digital camera and a two day photography masterclass by Jim Richardson from The National Geographic. The competition runs until 21 January 2011 and for details of how to enter, go to www.isleofjura.com/wishyouwerehere. The Scotch Malt Whisky Society and hotel chain Hotel du Vin have announced an expansion of their collaboration to a further nine hotels. The collaboration was originally started in January of this year and involved three hotels with the chain. This initial trial meant that the Society's members and whisky enthusiasts could enjoy a range of their whiskies in these three hotels and it has proved so popular amongst guests that they are rolling it out to the whole hotel chain. In addition to the SMWS whiskies being behind the bar, guests will get the chance to match whiskies with their restaurant meals and there will also be bespoke whisky tastings at each venue. For further information, go to www.smws.com or www.hotelduvin.com. The latest edition of The Whisky Round Table is now available for all to read. The hosts this month are Joel and Neil, our fellow London based bloggers, from CaskStrength.net. We are delighted to be one of the founder members of The Whisky Round Table, so hope that you will join us and our colleagues for this edition. To read the December sitting of the Whisky Round Table - click here. This month's subject is a debate about the discounting of whisky at Christmas by supermarkets and liquor stores. The Whisky Round Table is the brainchild of Jason Johnston-Yellin, who is the author of the 'must read' whisky blog Guid Scotch Drink. His idea was to gather together 12 whisky bloggers from around the world and get them to discuss a whisky topic once a month. The hosting of The Round Table is passed around the 12 members, with each host setting the question for each month. The November edition is the sixth offering and the hosting half way point for The Round Table and the subjects have been wide and varied to date. Links to the first six Whisky Round Table articles can be found by clicking here. The Tweeddale Blend is a whisky created by Stonedean Limited. The company was established by Alasdair Day, who is currently the director, in January 2009 and his aim was to resurrect an old blended whisky recipe that was last produced over 70 years ago. This was named The Tweeddale Blend and was produced by Alasdair's great grandfather, Richard Day. He owned a licensed grocery shop in Duke Street, Edinburgh from the early 1920s but the recipe for the blend dates back even further - back to the 1820s when the previous owners, J&A Davidson, followed the trend of the day and started producing their own range of blended whiskies. Upon gaining ownership of the shop and the whisky brand, Richard Day carried on production until the outbreak of World War II. It was not to be produced again until Alasdair came in to the possession of a family heirloom - a book containing the recipe for The Tweeddale Blend. This included the names of the single malts and grain whiskies involved, the type of casks that they were matured in and the quantities of each. Inspired by this, Alasdair set about recreating The Tweeddale Blend as closely as possible to how his great grandfather had produced it. 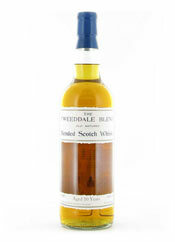 The sample that we tried is from the first batch of The Tweeddale Blend, which contains just 1,252 bottles. Another batch will hit the marketplace in the early part of next year and it will again follow the same traditional blend recipe of Alasdair's great grandfather. The exact recipe is a closely guarded secret but it is known that the Tweeddale has a single malt content of 50%, with the other 50% being grain whisky. This single malt percentage is high compared to other blends, which will generally contain anything between 10-40% as single malt. All of the whiskies included in the blend have a minimum age of 10 years. The Tweeddale Blend is bottled at 46% ABV and can be purchased from selected specialist retailers - a list of these can be found on Stonedean's website www.stonedean.co.uk. The colour of The Tweeddale Blend is bright golden yellow and the nose is pleasant but slightly understated with subtle notes vying for attention. These include noticeable aromas of toffee, sultanas, stewed apples, honey, vanilla and malty cereal grains. The initial understatement subsides with time in the glass, as the sweeter notes in particular come more to the fore. On the palate, this is distinctly malty and packed with cereals grain character to begin with. These notes are quickly joined by some lovely sweet elements including soft dried fruits (think of sultanas, dates and prunes), honey, toffee and vanilla. These sweet elements become more prominent on the palate with time, becoming pleasantly sugary by the time the whisky is swallowed. Two final flavours are detectable, but as nothing more than a hint - some nuts and bonfire smoke. The finish is decently long and is the palate in reverse. It begins with the sweet honey, sultana and toffee notes becoming slightly drier as the cereals come through. A final hint of woody spice (imagine nutmeg) adds to the interesting, almost bittersweet nature of the finish. This is a whisky that makes you throw any preconceptions that you may have about blends being an inferior product to single malt out of the window. It is very pleasant, positively full flavoured and firm in flavour, while being soft and easy drinking - it doesn't have the harshness or youth that can affect some blended whiskies. The blend has clearly been well constructed using good single malts and grain whiskies and these qualities show through in the final dram. We think that Alasdair has done his great grandfather proud. The Bruichladdich distillery (pronounced brook-laddie) is located on the Scottish island of Islay in the west Hebrides. The traditional Bruichladdich distillery style is in contrast to the smoky style of whisky for which Islay is famous - it is lighter, fresher and generally with little or no peatiness. The distillery was originally founded in 1881 by Barnett Harvey and sits on the shores of Loch Indaal - it was built using stones from the local beach and was one of the first buildings in the UK to be constructed using concrete! The current owners are the Bruichladdich Distillery Company. They are an independent consortium of four businessmen and they took over in 2000. It is a small distillery with an annual production capacity of just 700,000 litres and Bruichladdich translates from Gaelic as 'the brae (hillside) by the shore'. Examples of truly organic whiskies are hard to find - Benromach Organic single malt and the blended Highland Harvest are the two most readily available to the UK market. Here, Bruichladdich - the self proclaimed 'Progressive Hebridean Distillers' - have given a full scale release to their organic single malt whisky. This follows on from a limited edition organic release in 2009, which proved popular and won much acclaim. This new version will retail at £35-40 in specialist retailers and has an alcohol strength of 46% ABV. The whisky contains organic barley from three different Scottish farms and is certified as 'organic' by the Biodynamic Agricultural Association. 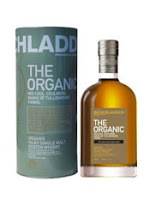 It has been matured in a combination of fresh oak and ex-bourbon casks and has been created from a selection of different ages by Bruichladdich's Master Distiller Jim McEwan. The colour of Bruichladdich Organic is a pale lemon yellow and the nose is youthful, fresh and vibrant. There is a lovely, appetising combination of aromas - firstly there are malty cereals, then juicy fresh green fruits (think of pears and apples) and vanilla, then something reminiscent of dried grass (or straw) and finally a hint of honey and some distinct almond notes. On the palate, this is light, delicate and again fresh. It has an immediate zesty (think of lemons) and mouthwatering quality that makes you want to have more. Through this comes prominent notes of vanilla, robust cereals and dried grass. These are followed by more subtle characteristics - some sweet honey, the fresh green fruits (especially pear - this is verging on peardrops now) and just the merest hint of some wood spice (imagine cinnamon). The finish is short, which is slightly disappointing. However, it is lively and crams plenty in to a short period of time - there is sweetness (vanilla, honey and a hint of icing sugar) to begin with, before turning drier with the malty cereals and dried grassy notes dominating. Finally, the flavours disappear to leave the burn of youthful alcohol in the mouth. This is a refreshing and delicate whisky, where the quality of the barley used in production and the casking used in maturation shine through. It would make an excellent aperitif dram. The whisky is on the lighter side and may not be to everyone's taste, but should definitely be tried if you have the chance. Any distillery looking to produce and release an organic whisky should look at this Bruichladdich for quality and use it as a benchmark. In our opinion, it is one of the better new releases of 2010.